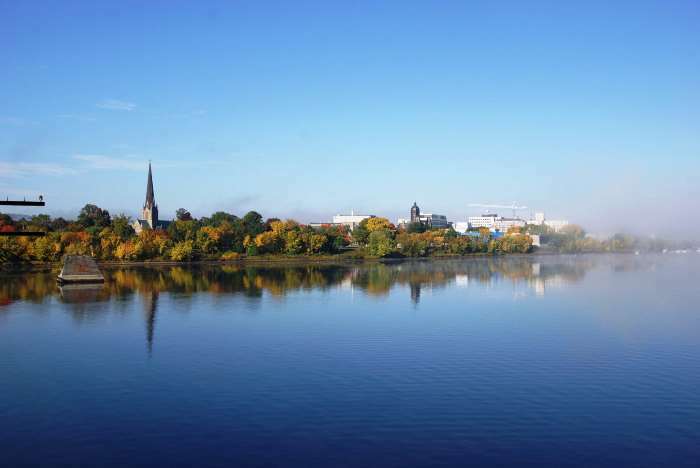 There’s one great attraction in downtown Fredericton that you really shouldn’t miss. It’s free, and it only requires a little effort. 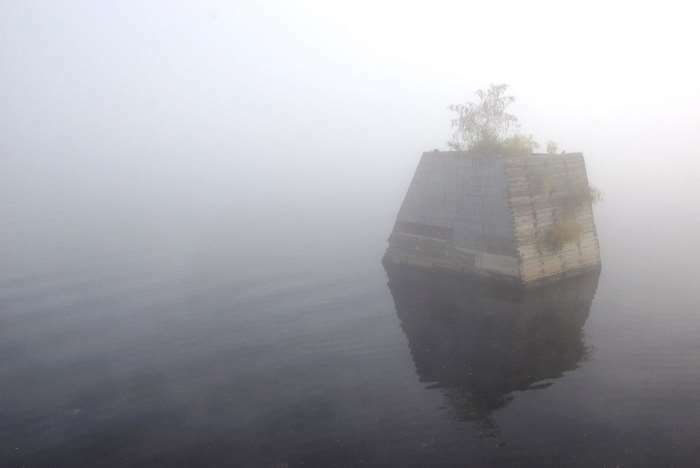 And, it rewards you with some of the best views of Fredericton that you’ll find anywhere — unless of course, you’re socked into a dense bank of river fog. And if you are, lucky you! That only makes a walk across the Bill Thorpe Walking Bridge all the more fun. 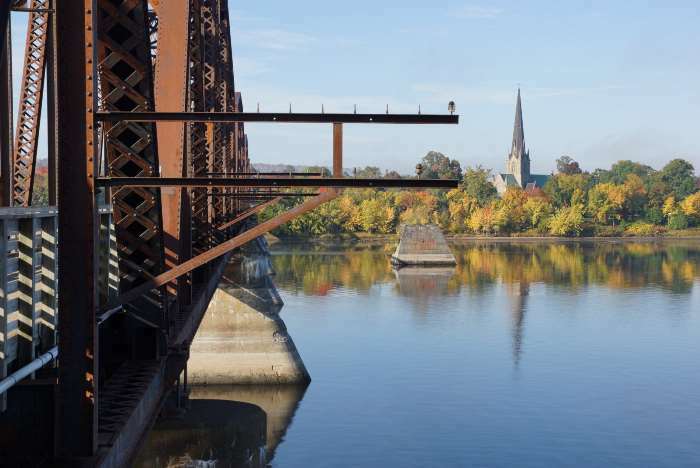 The Fredericton Railway Bridge, now known as the Bill Thorpe Walking Bridge, crosses the St. John River near the southeast end of downtown. I parked on George Street, near University Avenue, where the walking trail crosses the street. Alternatively, on the north side of the river, you could park at Carleton Park. I was bummed out by the weather as I drove into Fredericton. Everything was clear and sunny at my hotel, but as I got closer to downtown, I hit a wall of fog. I explored downtown and saw a few interesting sites, and figured I’d hit the road — but then, I noticed the Bill Thorpe Walking Bridge. Despite the fog, I decided to check it out. 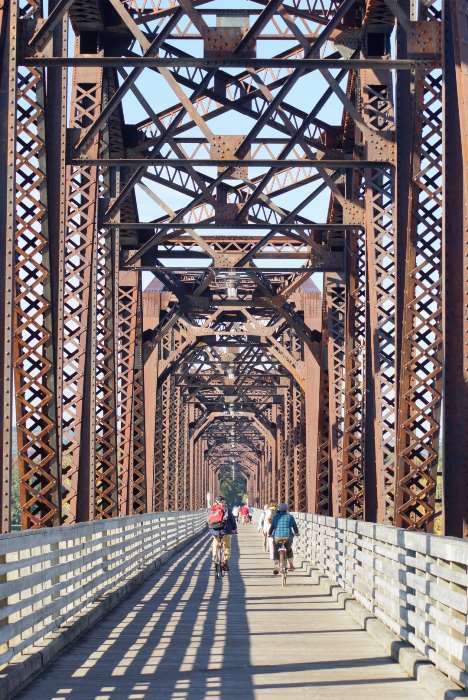 The bridge is part of an excellent walking trail system that will take you all around town. 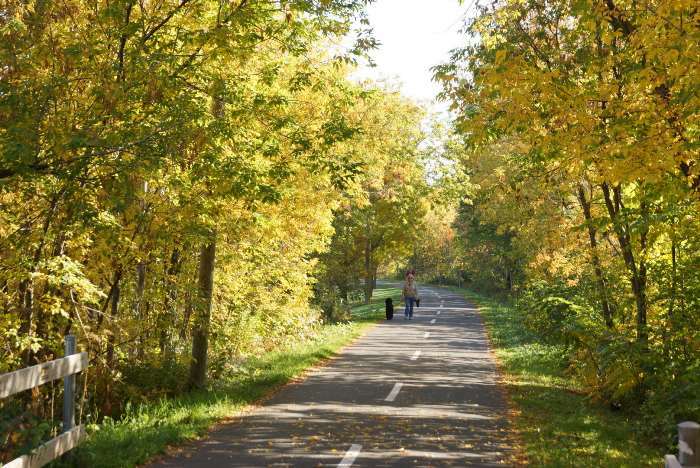 It’s also part of the Sentier NB Trail system, which covers the entire province. 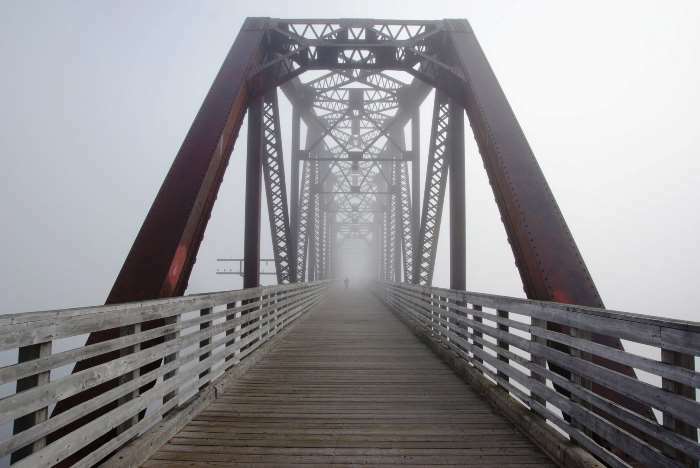 As I approached the bridge, I began to realize that the fog wasn’t a bad thing at all. The limited visibility was going to make the bridge especially interesting. At this point, a large group of aimless tourists were trying to figure out where to go. 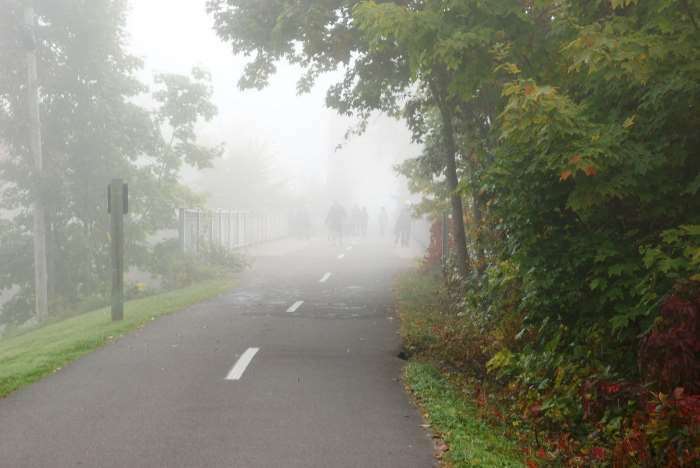 It looked like I was walking into a zombie movie! Once on the bridge, the crowds thinned out a bit. This beautiful old structure was completed in 1889, and carried trains until 1996. The following year, it opened to pedestrians. The bridge is 581 meters, or 1,906 feet long, meaning a round-trip walk across the bridge is about a 3/4 mile trip! 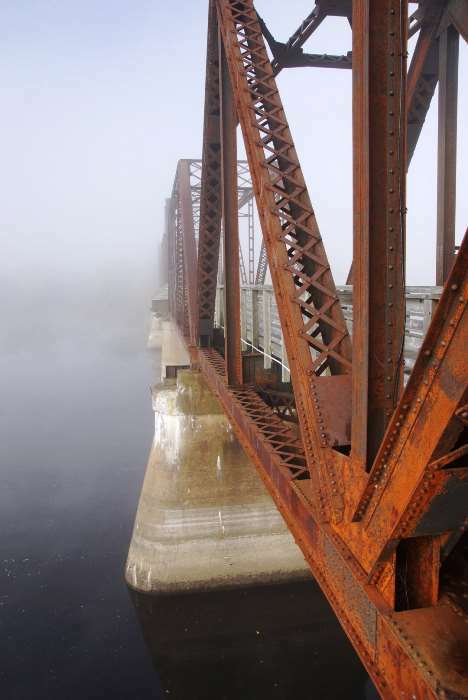 And thanks to the fog, the bridge was long enough to simply vanish about halfway across. Occasionally, a couple of hazy figures would emerge and become clearer as they approached. None turned out to be actual zombies. At some point in history, there must have been some other kind of structure next to the bridge. This old piling is all that’s left of whatever it was. 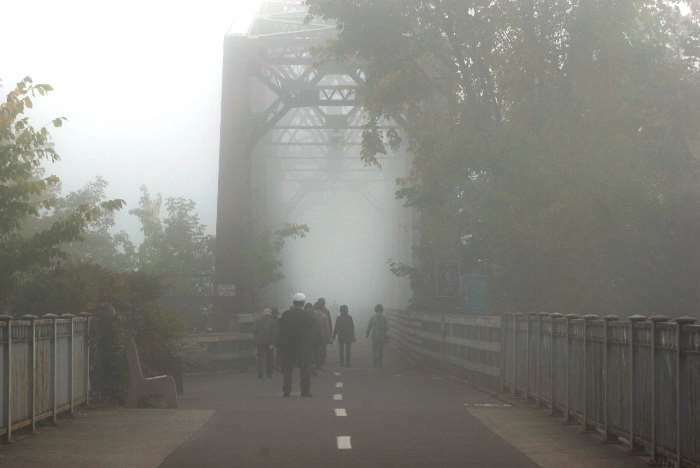 Once I made it to the north end of the bridge, I realized that the fog was lifting a bit, and suddenly the black-and-white world I had been experiencing was starting to have some color again. 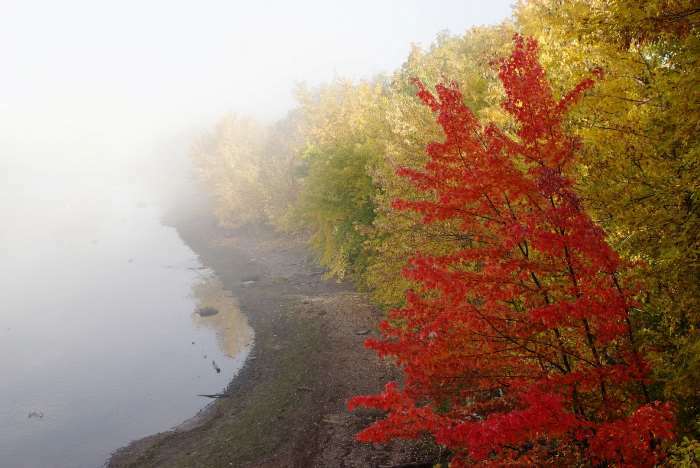 The north bank of the river had a lot of color, thanks to the changing fall leaves. My visit in the first week of October was probably just slightly before the peak of autumn color — one week later would probably have been ideal. On this end of the bridge, there’s a granite monument honoring Alexander “Boss” Gibson. 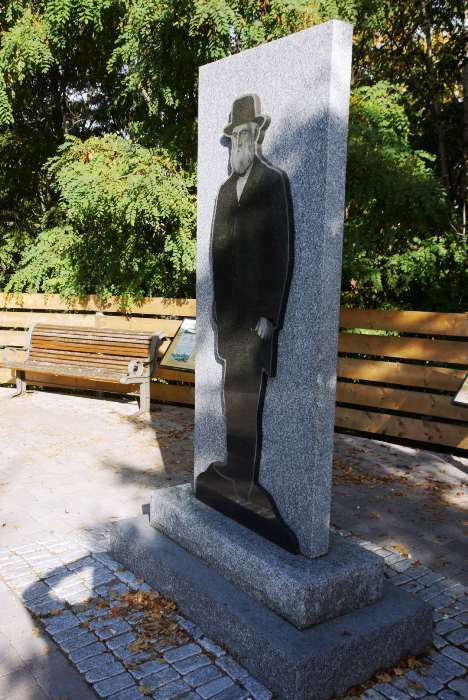 He helped build the area’s industry in the second half of the 19th century, first constructing a lumber mill and later a cotton mill. He also built the town of Marysville, a few miles to the northeast, as a factory town for his workers. The walk across the bridge had been great, but continuing up the trail looked to be just as nice. I didn’t have time for much more exploring on foot, but I could have kept going and going. And if I had, I would have found a side-trail to Carleton Park, just up ahead. Carleton Park is on the north bank of the river, and I’m guessing it has a pretty great view of Fredericton. … and a perfectly glass-like surface on the St. John River. I couldn’t believe this was the same bridge I had just walked across! 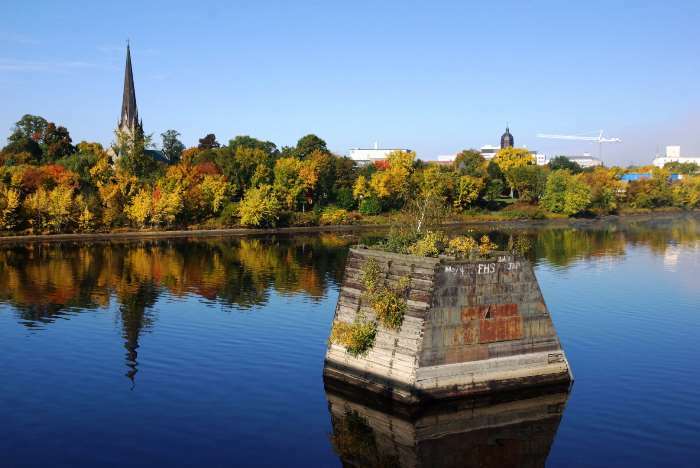 On the skyline, keep an eye out for the distinctive dome of the New Brunswick Legislative Building. It’s slightly older than the railway bridge, having opened in 1882. That old piling looks a lot different now, doesn’t it? 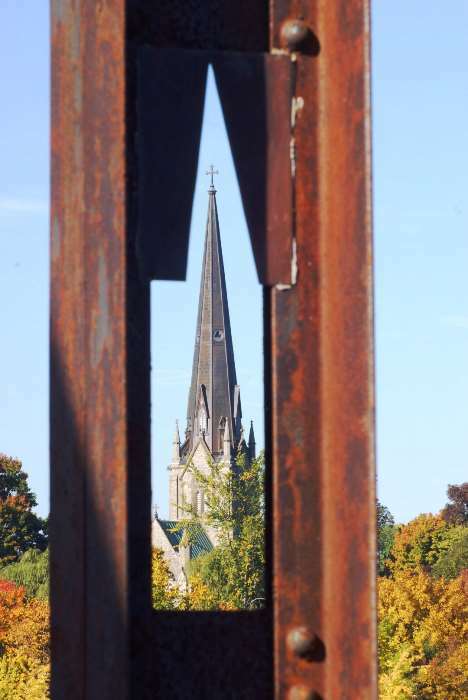 Of course, the most noticeable feature on the horizon is the spire of Christ Church Cathedral. It’s such an essential part of the skyline, there’s even one part of the bridge especially designed for a photo-op! At the end of the bridge, the trail will cross a big intersection (Waterloo Row, Brunswick Street, and University Avenue all meet here). From the bridge over that intersection, you’ll have another great view of the steeple. For a closer look at the church, make your way down to University Avenue. Christ Church Cathedral pre-dates the bridge and the legislative building. It was constructed between 1845 and 1853. 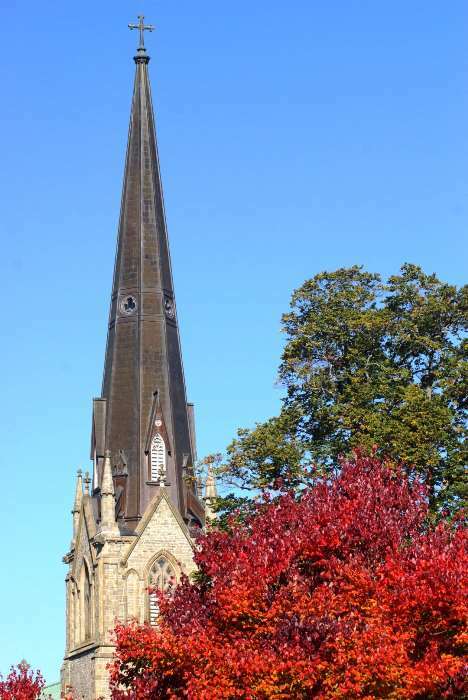 A lightning strike in 1911 led to extensive rebuilding of the steeple. 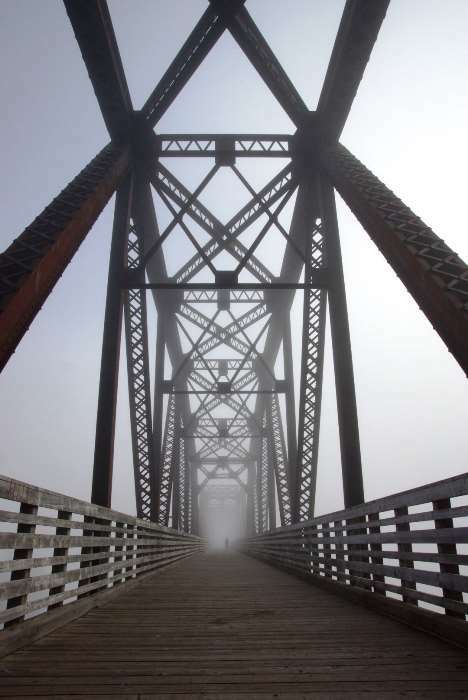 Whether you have fog or sunny skies, it’s a lot of fun to walk across Fredericton’s historic railroad bridge. 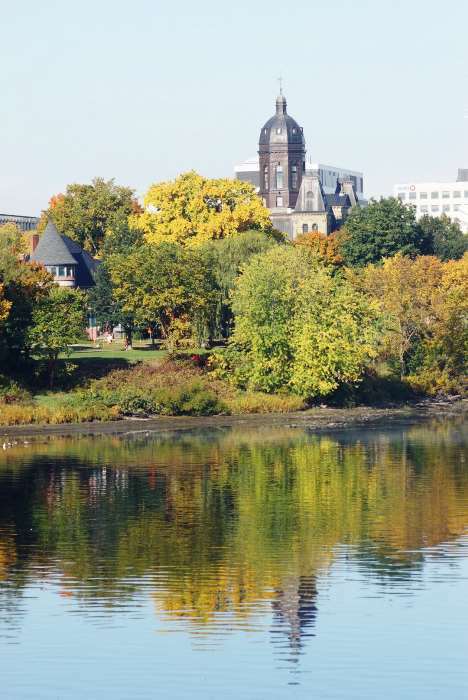 On New Brunswick’s finest days, you’ll enjoy a brilliant view of the city, and if you’re fortunate enough to visit during fall colors, it will be even better.